Paniai, Jubi - Hundreds of activists from the National Committee of West Papua (KNPB) of the Nabire region were reportedly arrested by Nabire Police Resort and secured in Nabarua Police Station. Political Education Diplomacy Commission KNPB Nabire, Alexander Pigai when confirmed Jubi said the arrest was when his side long march to the local police station to sue two of his colleagues who were detained by police on Monday (3/7/2017). "The arrest took place at 10:05 WP earlier in Meriam, when we go down the road to Nabire Police to ask the police chief and his ranks freed two of our colleagues, namely Andi Yeimo and Samuel Kobepa," said Alexander Pigai, Thursday (6/7/2017) . 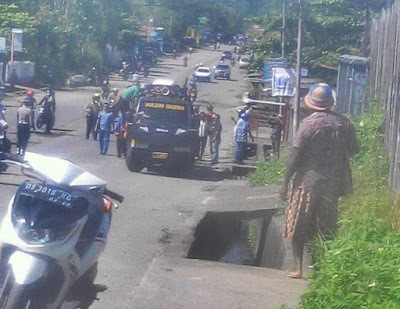 He explained that the two colleagues were in Nabire Police yard when he asked to release an activist KNPB Nabire, Yanto Waine who was arrested while distributing leaflets to commemorate 1 July as the day of Proclamation of West Papua. "Yanto Waine is missing three days from 30 June to 2 July. When we trace it he was detained in Nabire Polres. Yanto was arrested while on fly for a flyer on Jln. Medan, Karang Mulia. On July 4, 2017, the members of KNPB Nabire returned to the Nabire Police, demanding immediate release of the captured Yanto Waine, "he explained. According to him, at precisely 12.00 WP, his party, amounting to 30 people went to Nabire Police. Arriving there they negotiated with the police related to the arrest of Yanto Waine who was already four days in jail. "At 3 pm, all KNPB members were beaten by police and by then, Andi Yeimo and Samuel Kobepa were arrested and the other (28 people) were forced out on the highway," he said. "At 4 pm, all members of this number 28 were told to go back to the Police yard. From the Polres yard, the police claimed to promise us that Yeimo, Samuel Kobepa and Yanto Waine will be released by July 5, but only Yanto Waine will be released, "he said. KNPB Nabire spokesman Deserius Goo said his side again demanded to be free from the grasp of the persecution, but led to the arrest.